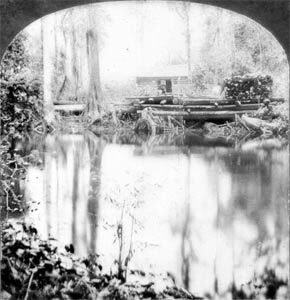 A landing on the Ocklahawa River, near the site of Payne's Landing, circa 1900. Florida Photographic Collection. Colonel James Gadsden, one of the planters who hunted Indians with dogs during the 1827 crisis in Florida, pushed for Seminole removal in 1832 in negotiations at Payne's Landing. The tribe did not want to go. The blacks were especially anxious, fearing exposure to slave claims if they left the security of Florida. The increasing number of slave raids onto the reservation, however, may have made the blacks more willing to consider a move. Moreover, the tribe as a whole was suffering. Since 1830, drought and hunger had ravaged the territory. Under the circumstances, Abraham and the chiefs agreed to send a delegation west to evaluate the new lands.